Have a good look at the picture above. If you click on it, you should get a larger version. The blogpost accompanying the picture explained that it was in response to a wish that the media would focus more on the good things that happen in the world. “The fact is that bad news sells; negative events cause spikes in TV ratings, sales of papers to rise and increases in traffic online,” the article continued – and this is fair comment; Vox Political‘s own highest reader figures have been generated by disasters like the passing of the Gagging Law. The article explained: “Man’s (and women’s) most primeval survival skill is to stay out of harms way; to be alert to threats or danger, and our brains are therefore hardwired to be highly responsive to negative stimuli. Bad is stronger than good because bad is inherently more threatening. The article went on to quote a specific example: “a very comprehensive list of all things that the Daily Mail have claimed ‘may’ cause cancer. The list includes water, soup, wearing flip flops and switching on the bathroom light at night. “It’s more hilarious than offensive but led us to want to have a cheap laugh at the Mail’s expense this afternoon, it being Friday and all. 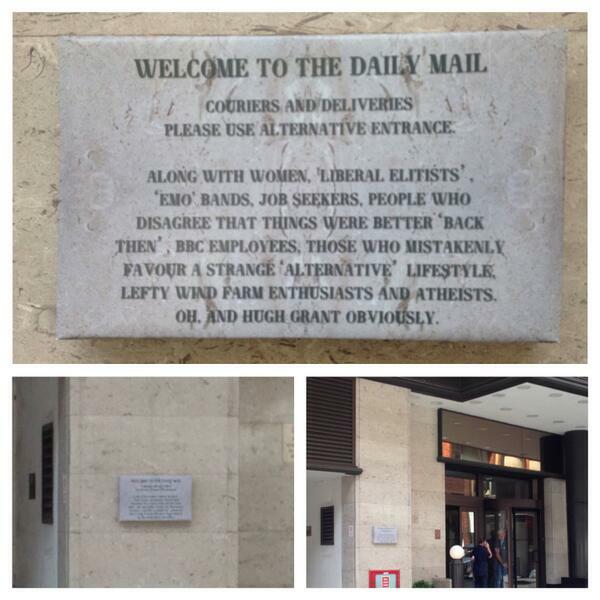 “So we made a faux-marble sign that we thought displayed a more accurate depiction of the Mail’s true editorial values, and sent someone – dressed as a workman in hard had and Hi Vis vest – to fix it to the side of their building in Kensington. “Amazingly, it was a full hour before somebody noticed and removed it. It must have felt good, though. Anyone wishing to keep an eye on Crowdwish’s future activities – or who wants to make a request – can do so via the address above. Vox Political has only one wish: financial independence. This independent blog’s only funding comes from readers’ contributions. Without YOUR help, we cannot keep going. I can’t reblog Scriptonite Daily articles, but this one will really beat the midweek blues so I’ll give you a taste and a link to the rest. “UKIP Leader Nigel Farage’s headaches this week did not stop at being whacked over the head with a placard by protesters in Kent. A UKIP Councillor blaming recent flooding across the country on divine retribution for Equal Marriage laws transformed the party from a concern, to a laughing stock – and now a Facebook campaign is under way to make ‘Its Raining Men’ number 1 to celebrate. “Henley on Thames Councillor David Sylvester wrote to his local paper to argue the nation was “beset by storms” because of David Cameron’s decision to act “arrogantly against the Gospel” in changing marriage laws. UKIP stood behind the comments until Sylvester went on to BBC Radio to defend them, at which point the party used emergency measures to suspend him. The full story is on Scriptonite Daily. Left-wing propaganda piece? 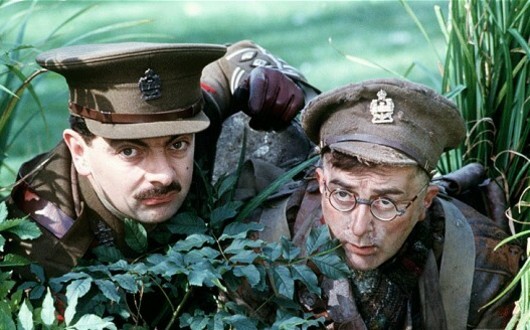 Sir Tony Robinson (right) with Rowan Atkinson in Blackadder Goes Forth. A new development has occurred in the story of Michael Gove’s attempt to rewrite the history of World War One as a glorious display of “patriotism, honour and courage”. This blog took Gove to task after he attacked one of Britain’s best TV comedies, Blackadder Goes Forth, for perpetuating “myths” about the conflict. Now Sir Tony Robinson, who played Baldrick in the much-loved series, has weighed in to warn Gove against attacking teachers. He told Sky News: “It’s not that Blackadder teaches children the First World War. “When imaginative teachers bring it in, it’s simply another teaching tool; they probably take them over to Flanders to have a look at the sights out there, have them marching around the playground, read the poems of Wilfred Owen to them. And one of the things that they’ll do is show them Blackadder. Gove appears not to have the wit to answer on his own behalf. Instead a spokesman plunged him even further in the mire with the following: “Tony Robinson is wrong. Michael wasn’t attacking teachers, he was attacking the myths perpetuated in Blackadder and elsewhere. Oh really? It’s fortunate Gove’s own words are available to be examined then, isn’t it? In his Daily Mail article on Thursday, he wrote the following: “The conflict has, for many, been seen through the fictional prism of dramas such as Oh, What a Lovely War!, The Monocled Mutineer and Blackadder, as a misbegotten shambles – a series of catastrophic mistakes perpetrated by an out-of-touch elite. Case proven. Gove is a liar, and he is trying to promote the teaching of lies to children. … and that doesn’t even begin to describe the Betrayal of Britain that started in 2010! Vox Political cannot keep showing up fools like Gove without funding. This site needs YOUR support to continue. Every penny will be used wisely. – Having failed to find a video clip, here’s an audio version of the scene in Blackadder Goes Forth, in which Captain Blackadder explains to Private Baldrick how World War I began. Michael Gove questions its accuracy but it seems correct, according to the history I learned at school. If anybody doubted it before, now we can be certain: Michael Gove does not want schools to teach facts – he wants your children to learn jingoistic propaganda. By rote. We can deduce this from his extraordinary attack on one of Britain’s most revered TV comedies, Blackadder Goes Forth. He said the show (which, as we all know, mixed some of the best verbal humour of the 1980s with searing social commentary and arguably the most moving ending of any TV comedy at all) peddled left-wing “myths” about the First World War, “designed to belittle Britain and its leaders”. According to politics.co.uk, Gove said the popular series had sought to denigrate British patriotism and had been used by “left wing academics” to portray the British war effort as a “shambles” led by an out-of-touch elite (so in that way, one assumes, the war was run much as the entire UK is today). “Our understanding of the war has been overlaid by misunderstandings, and misrepresentations which reflect an, at best, ambiguous attitude to this country and, at worst, an unhappy compulsion on the part of some to denigrate virtues such as patriotism, honour and courage,” the article quoted from his article in the Daily Mail. He’s wrong, of course. Putting patriotism to the side (it is arguable whether that is a virtue), honour and courage are celebrated by Blackadder; there is no lack of it in the lead characters. Blackadder is perfectly willing to help the war effort by foiling a spy in one episode, for example. Lieutenant George is full to the brim with ideas about honour, courage, fair play and Britishness. Even Baldrick does his bit (although he probably doesn’t understand why). The point of the show is simply that the title character is not willing to lead the men for whom he is responsible into certain death. “The conflict has, for many, been seen through the fictional prism of dramas such as Oh! What a Lovely War, The Monocled Mutineer and Blackadder, as a misbegotten shambles – a series of catastrophic mistakes perpetrated by an out-of-touch elite,” Gove continued. In fact, there are academics of all kinds happy to feed these notions because they are based on facts, rather than the ramblings of Mr Gove’s deluded mind. It is, frankly, terrifying that a man with such ludicrous and – in context – dangerous views may hold the position of Secretary of State for Education. Gove went on to claim that the war was a “noble cause” and a “just” conflict against the “social Darwinism” of the Germans. Social Darwinism, for those who don’t know, is the attempt to apply the concepts of natural selection and survival of the fittest to politics; it argues that the strong should see their wealth and power increase while the weak should see it decrease. It is strange that Gove should attract attention to this theory, as its strongest supporter in today’s Britain is his cabinet colleague, Iain Duncan Smith. Coalition policies on social security are clearly based on this principle yet Gove has never raised a whisper of protest against them. Gove went on to say the war “was seen by participants as a noble cause”. Of course it was – they were fed a constant stream of propaganda by their commanders, in order to ensure their co-operation and keep their spirits up. This did not mean soldiers could not use their own eyes and ears to work out what was going on, and repressive behaviour by authorities at the army camp in Etaples led to the mutiny of September 1917, dramatised in the novel (and BBC TV series) The Monocled Mutineer, which attracted considerable criticism at the time of transmission (1986) for alleged left-wing bias. It is worth noting that questions in Parliament after the novel was published led to the revelation that all records of the Etaples Board of Enquiry, where the mutineers were tried, had been destroyed long before. And Gove ridiculously claimed that the Battle of the Somme – which the politics.co.uk article claimed has become a byword for futile and indiscriminate slaughter, was a vital “precursor” to victory. In fact it was nothing of the sort. The Germans gave up because the failure of one offensive after another had left their troops severely disillusioned and their country in danger of revolution – which in fact took place shortly before Armistice Day. You have much to fear from an administration willing to have a man like Michael Gove running its schools. He would rather tell your children lies than let them learn the truth; it might give them political ideas that disagree with his own. His comments are yet more proof that we have a government built on lies. How are we going to change it? The debate about the Daily Mail and its attacks on Ed Miliband (via his father Ralph) and now Mehdi Hasan has been getting a bit serious, hasn’t it? What a good thing we in Britain are fortunate enough to have a grand tradition of satirical comedy, practised by people for whom nobody is a ‘Sacred Cow’ and anything is a candidate to be turned into a spitroast and hung over a barbecue. This clip is from The Now Show and features the songwriting skills of the ever-melodic Mitch Benn. If anyone else finds material that’s worth a chuckle and thinks it should appear on this site, please send it in. We could all do with a good laugh. 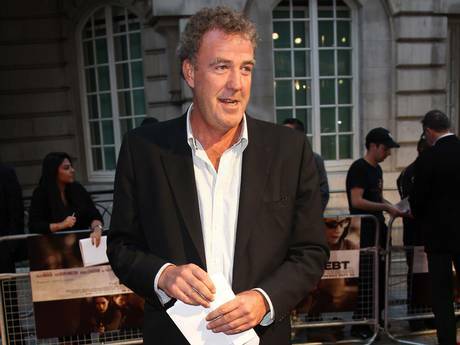 Start the week with a snigger: Jeremy Clarkson reckons he might try his hand at politics. He tweeted that he might stand for Parliament as an independent candidate for Doncaster North – Ed Miliband’s seat. Nobody should need to be told that Clarkson is a huge supporter of the Conservative Party, and is believed to be a friend of David Cameron, who is a neighbour of his in Chipping Norton. Yes, Clarkson is one of the famous ‘Chipping Norton set’. All right, Jeremy, since you ask. You are known around the world as one of the “three idiots” on the BBC’s Top Gear, which has become a comedy show about petrolheads, rather than a serious motoring show (and extremely watchable as a result). Every week, there is a feature in which you, Hammond and Captain Slow are set tasks and every week you manage to screw everything up somehow with your dunderheaded ideas. Now, I know that it’s just a TV show, but this is the public perception. Why on earth would anyone vote for you, based on that evidence? Having said that, you are also known as a supporter of the Conservative Party. Standing as an independent would not disguise this fact, so Tories in Doncaster North would be presented with a choice between supporting the Conservative candidate or supporting you – a high-profile Tory. The law of averages suggests some of them would vote for you, so that means you would split the right-wing vote and give Ed Miliband an even greater majority. On balance, therefore, this left-wing blog tends to support your idea. Go for it. Better still, why not follow John Prescott’s advice and stand in Chipping Norton, your current home? I believe the Parliamentary seat is Witney. If you split the right-wing vote there, it might give a left-wing candidate a reasonable chance of gaining the seat and giving your friends and neighbours a halfway-decent MP, for a change! Iain Duncan Smith – the Musical! When he realises we’ve started making satirical music videos about him, Iain Duncan Smith will probably think he’s hit the big time. This is a project that has been developing for a while, after RTU himself went around the media, denying all the factual evidence that said his benefit cap had not put 12,000 people into work, as he was then claiming. (A previous claim that 8,000 had gone into employment to avoid the effect of the benefit cap had been disproved by polling organisation Ipsos Mori, who surveyed 500 of those 8,000 people and found that only 45 had started work because of the cap. That’s nine per cent of the total claimed by the Secretary-in-a-State). On this particular media junket, he refused to countenance the factual evidence that was put in front of him, saying he “believed” the anecdotal evidence provided to him by a few members of staff at Job Centre Plus. That is now worthy of comment in itself, as he has been quick to dismiss the findings of the United Nations special rapporteur on adequate housing, Raquel Rolnik, as “anecdotal” – and she has spoken to far more people than he did! Inevitably, Vox Political published an article on the subject and – because the SoS had made it a matter of belief, prefaced the story with a few verses that could be sung to the old Not The Nine o’clock News/Rowan Atkinson song ‘I Believe‘. That would have been the end of it – but then it became clear that Mr … Smith was delaying a meeting with the Commons Work and Pensions committee, convened to make him account for his manipulation of the statistics. It seems clear that he has been waiting for the fuss to die down. Dear reader, you can probably work out the rest for yourself. The lyrics and music were available and, with the addition of a few more words, Vox Political went into the recording studio. The audio track that resulted is rudimentary but does the job. Yes, that is Vox founder Mike Sivier’s voice, for which he apologises. He played all the instruments as well, so he supposes he should be doubly apologetic. The video was put together with photographs trawled from the Internet, interspersed with specially-written captions, and is intended only to give YouTube viewers something visual to enjoy while they’re listening to the song. All the images are copyright their respective creators and were freely stolen for humorous use – for which, again, we apologise. We think the result is a lot of fun – amateurish, haphazard and slapdash though it is. It gets the point across. Please feel free to copy the code and embed the YouTube video anywhere you see fit. This was made to be seen, to be enjoyed, and to get across a message about Iain Duncan Smith and his beliefs. We hope you all enjoy it! Alternatively, you can buy Vox Political books! I hope nobody’s expecting me to produce any serious political commentary on Christmas Eve! Instead I’m going to get right into the modern spirit of Christmas by dishing you up a repeat of last year’s programming. It was my first ever blog entry – and not intended to be taken too seriously. I commented at the time: “I wrote what follows, a pastiche of the late, great Goon Show, to highlight governmental failings in the middle of last year , and I wanted to present it to you in this, my first ever blog entry. I’d like to think it offers a small, satirical snapshot of the way we saw our political leaders in 2011.” Now, after another full year of Coalition lunacy, I suppose we could all look back on those days and smile wistfully. We didn’t know when we had it good. SPEAKER: This is the BBC. Big Budget Cuts presents: The Goon Show! Welcome to the House of Commons on this glorious day in mid-2011! I call on the Prime Minister, Mr Neddie Camergoon. Mr Camergoon! SFX: Background noises of the House of Commons. Wolf-whistles, jeers, sheep-like bleating etc. NEDDIE: My friend, the member for Shipley, makes a very good point when he asks why we’re letting disabled people sit on their backsides. Let me be clear on this: Walking sticks cost money and in times of austerity this government can hardly prop itself up, never mind anyone else! NEDDIE: But his claim that they should be allowed to do an honest day’s work for less than the minimum wage is one that I’m sure our friends in big business will be very pleased to hear! MILLIE: Thank you, Mr Speaker, buddy. What – what – what does the Prime Minister intend to do, to allay fears that the NHS will be privatised by the back door? NEDDIE: I thank the honourable gentleman for his question. In answering – and let me be clear on this! – I think he should know the only private backdoor I’m worried about is this! SPEAKER: Mr Camermoon! Pull your trousers up at once! Order! We will now hear a statement from the Secretary of State for Defence on Why We Want to Bomb Johnny Foreigner At Huge Cost to the Public Purse. The Defence Secretary – Dr Liam Censored! SFX: Background noises fade out during the following line by Neddie. NEDDIE: Dear Diary: Leaving the House of Conmen, I made for the Prime Minister’s office in the Palace of Westminster – a sanctuary which was itself feeling the strictures of the modern drive to Austerity! POSH VOICE: Great booze-up, Neddie! NEDDIE: Yes, what is it, Clegg? BUTLER: Sir, there’s someone to see you in your inner sanctum. NEDDIE: My inner sanctum? But I’m the only one who’s allowed to be sanctimonious in ‘ere! BUTLER: I’m afraid she insisted. SFX: A door opening and closing behind his next line; the party sounds become much more muffled, but do not die away completely. NEDDIE: Good heavens! Isn’t that–? NEDDIE: He’s just been Owww! THATCH: Yes, it’s all the rage. GEOFF: You gotta go Owww! THATCH: So, Neddie, dear boy, how are you enjoying the office? I remember when it was mine, I had it decorated all in black leather, as far as the eye could see, with an erect horsewhip motif! THATCH: Yes indeed. I notice you’ve retained it. NEDDIE: Well, I did go to Eton! NEDDIE: He’s just been Owww! Again! THATCH: Yes. He never thinks of anything else these days. NEDDIE: Perhaps he went to Eton, too. THATCH: Settle down, Neddie. Have a gorilla. NEDDIE: No thanks; they hurt my throat. THATCH: Oh – naughty gorillas! NEDDIE: Have one of my monkeys – they’re milder! THATCH: All right; I’ll have William Hague. THATCH: Did I call you Charlie? I do apologise. You see, you look like a Charlie to me. Why don’t you pull up a chair? NEDDIE: I prefer to stand. THATCH: Very well – stand on a chair. Now, Neddie, we need your help! We’ve learned that – in their last months in office – the dreaded Laborious Party were raising a deadly creature to defeat us! NEDDIE: Those fiends! So it’s all Labour’s fault! THATCH: You see, the Eco-gnome is too small, Neddie! NEDDIE: Sort of an eco-garden-gnome? THATCH: Precisely! So they started building it up into a thrusting new ‘Tiger’ eco-gnome, worthy to take on even the emerging powers of India and the Far East! NEDDIE: Tiger Bay? So it was the Welsh eco-gnome! THATCH: And that’s where you come in. Neddie, we want you to bring this tiger to heel before it gets out of control altogether! GEOFF: You’ll be Top of the Toffs if you do! THATCH: And as a reward, I shall personally give you a postal order for five pounds in fivers. That’s five whole pounds, Neddie, plus my gratitude! NEDDIE: What an honour! I shall start at once! Top of the Toffs? Me? CLEGG!!! SFX: Door opening and closing; party noises get louder when it opens and die away again as it closes. THATCH: If he brings the economy under control, we’ll be well in the money. We can call on favours from the whole financial sector. Our friends in the city will make us rich beyond the dreams of Goodwin! And you know what that means, don’t you? TOGETHER: (singing) April in Paree…! NEDDIE: I knew I’d need help tracking down a tiger, so I called my friend Boris. Let me be clear on this: he resembles a bear more than a tiger but I thought he might have contacts. SFX: Telephone ringtone ‘Tomorrow belongs to me’. MURDOCH: G’day Prime Minister! I hear you need help with your etcetera etcetera etcetera! NEDDIE: How did you know? MURDOCH: I’ve been hacking into your phone calls. What? No! What am I saying? I mean, I have my sources! NEDDIE: And who are you? MURDOCH: Allow me to introduce myself! I’m Major Rupert Murdoch, late of Her Majesty’s First Dirty Diggers! I’ll be delighted to chase your beast to ground – for a small consideration, of course! BROOKS (incredibly deep voice): Major! The Tiger Economy is at large in the North of England! MURDOCH: Thank you, Rebekah! How do you know that? BROOKS: We got it from John Prescott’s voicemail! MURDOCH: The game’s afoot! And now, a short interlude. NEDDIE: Right, round the back for the old brandy! SPEAKER: Part Two, in which our heroes (ha ha) find themselves in a position familiar to many commuters in modern Britain. NEDDIE: Why are we slowing down? MURDOCH: We can’t go this way! There are rioters up ahead and your Home Secretary has called out the Army! NEDDIE: She’s done what? I thought we sacked all the squaddies. Right! Turn around! SFX: Car screeching to a halt, reversing, squealing into motion again. SFX: Car screeching to a halt. MURDOCH: It’s a student demonstration against the trebling of tuition fees and the scrapping of the EMA, whatever that is! SFX: Car reversing, squealing into motion again. NEDDIE: All these U-turns! At this rate – and let me be clear on this! – we’ll never get anywhere! NEDDIE: This had better be good. MURDOCH: It’s a tree that’s fallen across the road! NEDDIE: What what what what what! Now even the forestry is putting us into reverse? (Sighs) You know what to do. NEDDIE: Stop! Stop the car! I want to get off! Stop stop stoppeee! BYSTANDER: ‘Ere – ain’t you the Prime Minister? BYSTANDER: If that’s what you do to yourself, think how we feel about yer! NEDDIE: Dear Diary – We found ourselves in a desolate slum alley that could be anywhere north of Finchley. MURDOCH: Right, this’ll do. Assemble the troops, Rebekah. BROOKS: Yes sir. Anything else? SFX: Lots of ‘falling in’-type sounds as Murdoch’s slovenly band of ragtags assemble themselves. MURDOCH: Hacks – from the right, number! NEDDIE: Why are they only saying the same number? MURDOCH: My hacks all think they’re number one! Right, boys – spread out and look for it! MURDOCH: The beast! Look for the beast! You’re not at the News of the World now! HACK: Major M – we’ve found a lead and we’re pursuing it! MURDOCH: What? Ooh, me narglers, that was quick! Show me. BROOKS: This is the man, sir. MURDOCH: Thank you, Rebekah. Go and have a drink of water. Now, what’s the matter with him? MURDOCH: That won’t do at all! Quick! Open up his jacket and take the weight of his wallet off his chest! WILLIUM: Ohhh – Mate! Hands off the merchandise! MURDOCH: That’s more like it! Speak up, man – what happened to you? WILLIUM: Ohhh – Mate! I come up here to get away from the pressures of the city, didn’t I? Me banker’s bonus was getting’ me down, mate! NEDDIE: What what what what what what? You were feeling guilty that you had so much and other people didn’t have anything? WILLIUM: Nah, mate! Not big enough for the holiday I wanted in Bermuda!… Only six watts? You’re not very bright are you? NEDDIE: I don’t wish to know that. NEDDIE: Ying Tong Iddle I Po! WILLIUM: All right, well I come up ‘ere instead. There I was, mindin’ me own business when some bloke sez, ‘Dost tha’ see that ‘orrible cloud on’t ’orizon? ‘Appen ah wunduhs what that is, lake’. I didn’t understand a word but up I looks an’ WALLOP! First I was inflated, then deflated and then I went into a slump! HACK: That’s how I found ‘im, sir! NEDDIE: You poor man! How do you feel now? WILLIUM: A bit downhearted, mate. NEDDIE: He’s going into a double-dip depression! Quick! Get him to a hospital! SFX: WHOOSH! (Ambulance noises) WHOOSH! MURDOCH: That was quick. Was that a National Health ambulance? NEDDIE: Good lord, no. They can’t afford ambulances these days! That was from the new, private healthcare company – Neddie’s Health Service! Now give me his wallet. Let me be clear on this: he’ll need every penny where he’s going! MURDOCH: Camergoon – we’ve got a lead! And we’re going to put it on your beastie! This man says he’s seen the eco-gnomee in the flesh! SPRIGGS: Hello Jim! Hello Ji-im! Hello Jim. CAMERGOON: You’ve seen it? It’s come out of recession? SPRIGGS: No Jim, I’m saying it’s been living in my house! SPRIGGS: I came home for the weekend and there it was, feet up, reading the paper, Jim. In the library. CAMERGOON: Hmm. The library, you say? SPRIGGS: The library I sa-ay! CAMERGOON: Where does he live? I mean, where do you live? MURDOCH: Number 23 Perversity Gardens, Twinge! We can get there quick if we hop on the next musical link. MURDOCH: Ahooh Oh Ooh! That’s what I get for hopping on a link with no corridor! Here we are! SFX: Knocking on the door. Door opening. CAMERGOON: Excuse me. I’m so sorry to bother you, but we have reason to believe the British economy is living at this address. CAMERGOON: Only we’d like to have a word with it, if possible. Could it come to the door? SFX: Elephant roar, followed by donkey braying and farting. Door slams. SPRIGGS: Oh dear, Jim. What will the neighbours think? FLOWERDEW (camp voice): Shut up you! It was perfectly quiet here before you came along! NEDDIE: Hang on. An elephant – and then a donkey? And we’re looking for the tiger economy? NEDDIE: It’s all rather confusing, really. MURDOCH: We’ve got to show it who’s boss! NEDDIE: We’ll have to starve it out! Quick! Cut public spending by 16 billion pounds! In Sterling! NEDDIE: I don’t wish to know that – oh I see. SFX: Door opens. Hoofbeats galloping nearer. SPRIGGS: At last! The economy is speeding up! MURDOCH: Don’t let it get away! Grab it! Look out – it’s going to charge! LITTLE JIM: He’s fallen in the wa-ter! MURDOCH: Here lad – take my hand! NEDDIE: Why? Are you a stranger in paradise? SFX: Hoofbeats. Donkey noises and farting sounds. NEDDIE: It’s weakening! One more push ought to do it! Push VAT up to 20 per cent! SFX: Donkey farts. A monumental crash to indicate the beast keeling over. MUSIC: The Specials – Ghost Town. BOTTLE: Have you ever minded a vicious tiger eco-gnome before M’Eccles? SFX: More rapturous canned applause. M’ECCLES: Oi’m not really boddered by it now, either. Mr Chancellor of the Exchequer Bluebottle sir. M’ECCLES: It does not bodder me… at all. BOTTLE: You’re a happy-go-lucky boy, ain’t you, M’Eccles? BOTTLE: You’re a naughty cruel thing, M’Eccles! You might have an eco-gnome of your own one day! M’ECCLES: Oi don’t t’ink so, Bottle. Oi always wanted to work in der Treasury but der bigger boys wouldn’t let me! Look at M’Eccles dere, dey said. ‘E can’t do ‘is sums, loike. So, I just sit ‘ere wid moi bricks an’ ignore dem! M’ECCLES: You want to be careful what you say to me, Bottle! ‘Ave you heard of Traf’n’galgar Square an’ Mill’n’bank? Well… just you watch it den! Oi’m der Secretary of State for Education, me! BOTTLE: Yes. You’re an important man in White’n’hall! BOTTLE: So why does you keep on makin’ up different types of school and then spending hundreds of dozens of Sterling-type pounds on them? M’ECCLES: Oi’ll tell you why, moi good man! If oi keep goin’, oi’m bound to foind one dat doesn’t make me stand in a corner wid a pointy ‘at on moi ‘ead! BOTTLE: But I don’t know which school I’m goin’ to, now! There’s five on my street! M’ECCLES: Dat’s freedom of choice for you. BOTTLE: Is that enough amusing-type dialogue for the listeners? Good, ‘cos it is time to feed the ani-mile. M’ECCLES: Well all right, oi’d like bangers and mash. And afterwards, if you’re nice, oi might let you pat me on der head. BOTTLE: Not you, my good man! M’ECCLES: Oh you mean der udder animal. Ho-kay den, what ‘ave we a-bin givin’ it? BOTTLE: Disabled people … and students. M’ECCLES: Yeah- ‘Ere! Oi’m der Minister for Students ‘ent oi? If you’m feedin’ ‘im students, who am oi goin’ ter be der boss of? BOTTLE: Do not worry, my good man! My captain says it is all right. He says he’s makin’ your job easier. M’ECCLES: Well den, moi good man, oi’ll make your job easier! SFX: Footsteps fading away into the distance. BOTTLE: What is this? M’Eccles? Where is you goin’? Don’t leave me in da dark! I don’t like it here! SFX: A loud clank – a chain rattling. Then a loud noise of a chain breaking. BOTTLE: What’s dat? M’Eccles? Was that you? Are you having a practical joke-type laugh? Are you gonna come back so we can be all boys together? I’ll let you go ‘Owww’! BOTTLE: I wonder what it would be like to see the inner workings of a major western economy first-hand? BOTTLE: Oaoww so this is what it’s like! SFX: Choking noises. Loud crash. Death rattle. NEDDIE: (Voice fading in, to show he’s entering the room) Right, let’s get to work on this Econo-thing! We’ll soon have it jumping at our very command – wait! What’s this? Why is it lying on its back with its legs sticking up in the air like that? Call me a pessimist, but- I… don’t think it’s supposed to be doing that! NEDDIE: Clegg! Prise its jaws open! NEDDIE: It’s a masticated Chancellor! What are you doing in there? BOTTLE: You’ve deaded me! Look at my superhero-style shorts! They’re all chewed to ribbons! I am expo-sed! How am I going to get Molly Prock to look at me in the playground now? NEDDIE: If you’re that exposed, it won’t be a problem! Clegg! Close it up again; it’s the only way he’ll be quiet! SFX: Loud creaking sound, over BOTTLE’s protestations. BOTTLE: But- No- My Captain- Wait- It’s all gone dark! NEDDIE: Dear diary- oh, silly me! I lost it. I’ll have to make a mental note. Mental note: What am I going to do now? The economy is as dead as the NHS will be, if Andrew Lansley gets his way. We must revive it! But how? It’s all Labour’s fault! MILLIE BANDISTER: Mr Camergoon! I want a word with you! MILLIE: (drowning him out as soon as he’s said ‘morning’) Mor-ning! (Everyone joins in, so we get a chorus of ‘Morning!’s for a few seconds). MILLIE: Yes. Mr Camergoon, allow me to introduce Henry Crun. He’s a private investigator. CRUN: Yes, Millie. I investigate privates. MILLIE: Tell him what else you’ve investigated. CRUN: Mr Camergoon, I found a diary! NEDDIE: What’s that got to do with – wait! No! Not … my diary? MILLIE: Shame on you, Mr Camergoon! MILLIE: Yes, Henry, you’ve made your point. CRUN: That – what? Please don’t interrupt, Millie! This is a long list! Now… where was I? MILLIE: Mr Camergoon, you have not been straight with the British people! When I heard about your tax breaks, I asked the people at Customs and Exercise what was going on and they said £120 billion per year isn’t being collected from the rich! Either you get them to pay up now, or you can pay it off yourself! MILLIE: We have your diary! It’s all the proof we need. When the public find out about this, they’ll want your head on a plate! CRUN: And possibly other parts of you. Your cuts have made them very hungry and you are quite… rotund. SFX: Commotion as of a door opening. Sound of a tape being played very fast to indicate conversation. BUTLER: Sir! Disaster! Riots have broken out in London and are spreading to other cities! It’ll cost at least £100 million to clean up! MILLIE: So Mr Camergoon – who will have to pay? Your rich tax-dodging Bullingdon banker chums? Or will you foot the bill? NEDDIE: Come come, dear friend! Let’s not be hasty! Let’s discuss strategies! Let’s talk about it! Let me be clear on this! NEDDIE: Let’s all go ‘Owww’ together! MILLIE: Yes – for £100 million pounds! MILLIE: One hundred million pounds please! SPEAKER: That was The Goon Show, a Big Budget Cuts programme. Script by Mike Sivier in tribute to Spike Milligan – Order, order! – and the programme that was originally produced by Peter Eton, Pat Dixon, Charles Chilton and John Browell. ORCHESTRA: Signature tune up to end. A man who hid in a toilet in order to get near enough to David Cameron to shout, “No ifs, no buts, no public sector cuts” has been sentenced to community service. The public were quick to spot the difference in treatment between this man and Andrew Mitchell, who verbally abused a policeman (an arrestable offence) but was not prosecuted. One wonders what punishment the young man in this photograph would have received for the words here. One of the best ways to make a point on the internet – satirical or otherwise – is to create a ‘meme’. For the uninitiated, this is a picture that has been modified to make a point, then sent around the net via Facebook, Twitter or other social networking sites. Some of the recent ones have been very good so, while I work on my next piece (probably Cameron selling weapons to the Middle East), I thought I’d put them on show. David Cameron will always be remembered as the Prime Minister who re-introduced class, and class war, to the UK with his Cabinet of millionaires, and government of aristocrats. Here, Paul Weller gives him the scorn he deserves. Pastor Martin Niemoller’s famous words about the Nazis get an IDS update here. In a week when Iain Duncan Smith turned the glare of his DWP spotlight onto step-parents, single parents and “broken” families, the targeting might seem a little off, but the words still ring true, and it shows that comparisons with Nazism are still coming thick and fast. The fact is that both the Conservatives (now) and the Nazis (in the 1930s) got into government without getting a majority of the national vote, and then set about policies that were not what they had professed to the public. Finally, a little background reading. Next time you hear the Insidious Dole-Snatcher – or any of his chums – spitting out these claims as though they’re true, just take a moment to check their veracity. The link is in the image. Cabinet reshuffle: Does Cameron think he’s the Joker? One person who didn’t leave the government in the Cabinet reshuffle was David Cameron himself – despite appeals from a multitude of sources (including this blog’s readers) for him to do so. Today’s blog entry will be relatively short. I had an operation on my leg yesterday (September 4) and it seems to be affecting my ability to think. … And if you think that’s bizarre and illogical, let’s have a look at the decisions made by David Cameron in yesterday’s Cabinet reshuffle! Firstly, the really shocking news: George Osborne is remaining as Chancellor of the Exchequer. Not really news, I know, but at the outset it makes a mockery of a process that is supposed to be about improving the government of the UK. Osborne’s policies are a disaster; he has sent British industry nosediving while increasing borrowing by £9.3 billion in the last four months. He was booed when he got up to give out medals at the Paralympics and he was booed at Prime Minister’s Questions today. But he remains in the Number Two government job. Also remaining in post are Home Secretary Theresa May and Foreign Secretary William Hague; Education Secretary Michael Gove surprisingly keeps his brief, despite having proved by his activities that he is not up to the intellectual challenge (see previous Vox articles). Biggest winner in the reshuffle has to be former Culture moron – I mean secretary – Jeremy Hunt, who has been moved up to take the Health brief. This has been seen as a reward for his work on the phone hacking controversy that led to the departure of former News of the World editor Andy Coulson from the Downing Street press office, and to the Leveson Inquiry into the behaviour of the media. This seems a nonsensical move. Leveson has ordered not only Cameron, but Cameron’s friends Coulson, Rebekah Brooks (who now faces criminal charges for her part in phone hacking), and Hunt himself to give evidence in hearings that were highly embarrassing for those under scrutiny. This may not be far from the truth. Hunt co-authored a book dealing with the NHS at length, with Daniel Hannon MEP who called the NHS a 60 year mistake. The book states: “Our ambition should be to break down the barriers between private and public provision, in effect denationalising the provision of health care in Britain“. He reportedly tried to remove the NHS tribute from the Olympic Games opening ceremony and his record in government is as dodgy: he voted to halve the time allowed for an abortion from 24 weeks to 12. His support of homeopathy has also attracted ridicule from some quarters. Hunt’s arrival at Health follows the ejection of Andrew Lansley, the man who worked for eight long years on his Health and Social Care Bill, that effectively privatised health care in England. This work constituted the biggest lie this government ever sold to the public – that the Conservatives would safeguard the well-loved 64-year-old national institution. His reward? Demotion to become Leader of the House of Commons. Former employment minister Chris Grayling, a man who believes bed and breakfast owners should be allowed to ban gay couples, has been promoted to the Justice brief. In response, one tweeter asked if Cameron will be building more prisons. This means the oldest Cabinet member, Kenneth Clarke, has been ejected from Justice. David Cameron reportedly tried to sack him outright, along with departing Conservative co-chair Baroness Warsi, but ended up compounding his weakness by creating new roles for them instead. Clarke will be a minister without portfolio (although it is believed he’ll be sticking his oar into Osborne’s business at the Treasury), and Warsi will be minister for faith and communities. That would be tireless self-promoter and foot-in-mouth artist Grant Shapps. Scraping the bottom of the barrel… The new Transport secretary, Patrick McLoughlin, is afraid of flying. And the former minister for the disabled, Maria ‘Killer’ Miller, is the new Equalities minister. She’ll be victimising women, gays and ethnic minorities as well, from now on. If you think that’s harsh, bear in mind that she voted for a (heavily defeated) proposal to stop abortion providers like Marie Stopes counselling women, and is on record as being in favour of defining homophobia, racial hatred and prejudice as ‘freedom of speech’.